When a removable appliance is the solution you prescribe, you can trust Mike’s Superior Dental Lab to get it right! We understand how important a superior-quality appliance is for your patient. It is a privilege to play our part in restoring your patient’s smile and self-confidence with our beautiful and naturalistic products. But, beautifying your patient's smile is just the beginning. An expertly-designed dental appliance delivers comfort, improved functionality, and can also improve the appearance of the surrounding skin and facial muscles. We work closely with our customer dentists to ensure that the finished product is reflective of the patient’s existing features. Our customized designs incorporate the information you provide us regarding your patient's anatomical measurements, face shape, complexion, gender and age. The finished product is a superior denture or partial that is as unique as the patient who will wear it. An added value to using our lab is the delivery timeframe. When we are provided with great impressions and bites, we're able to work very effectively and efficiently. Resets are rare, so in many cases, your patient can receive their beautiful permanent premium dentures or partials within two quick visits to your office. Observe the before and after pictures of a patient in need of quality dentures. The "before" depicts a patient with a prematurely-aged appearance. The protuding jaw, decreased space between the nose and lip, and sagging skin around the mouth and cheek area make this patient look much older than she should. 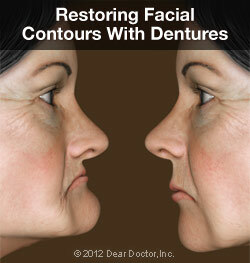 The "after" picture illustrates the youthfulness that can be restored with a quality denture. There is a noticeable difference in the shape of the patient's profile and skin. Other features that can be improved with a denture fabricated at Mike's Superior are increased fullness of lips and more rounded cheek areas. Our skilled technicians understand that design technique and tooth selection play a critical role in the quality of the end product. Your satisfied patient will just know that their naturalistic appliance looks and feels great! Entrust us with your next dental prosthetic appliance and you will see the difference that the right lab can make in your patient's overall satisfaction. At Superior, we aim to please! 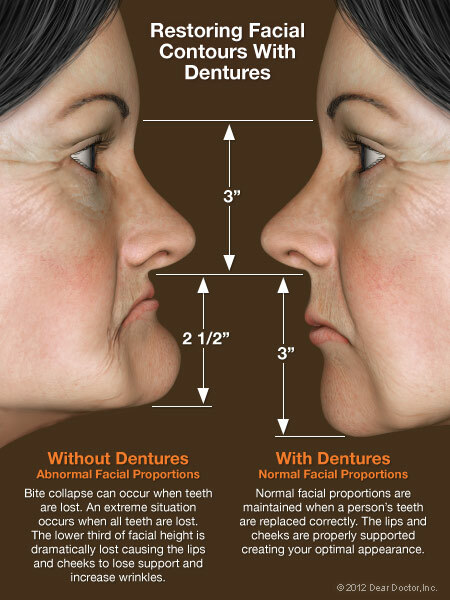 Learn about the different types of Full Dentures we offer.